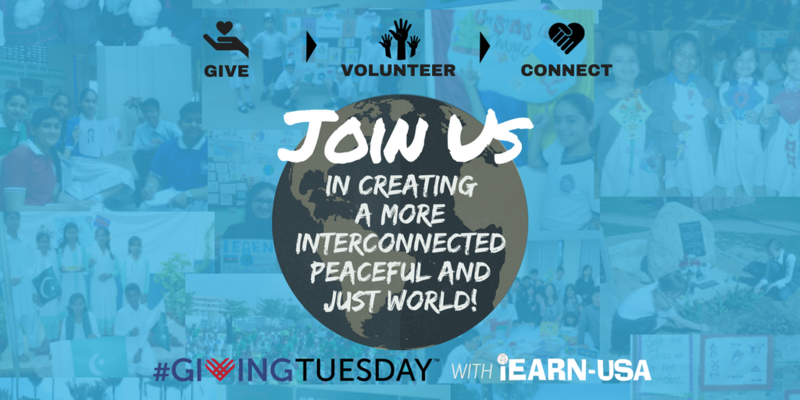 Join iEARN-USA on Tuesday, November 28, 2017 as we celebrate Giving Tuesday! What is Giving Tuesday? Giving Tuesday a global day of giving, volunteerism and kindness! Our goal on Giving Tuesday is to raise $7,500 in funds to support iEARN's global education programs, and bring awareness to iEARN's vibrant community of youth and educators around the world! Be a Champion of Global Education and make a gift to iEARN-USA today! Make a gift in honor of Giving Tuesday. Your donation will go towards strengthening iEARN's programs and providing more educators and youth opportunities to learn with the world! In honor of #GivingTuesday we'll be hosting 12-hours of live video chats and webinars introducing iEARN-USA's programs and international community. RSVP now at https://passporttoiearn.eventb... to receive updates and reminders. We'll be hosting an Open House and Happy Hour at iEARN-USA's Office in NYC, 4pm-7pm, 475 Riverside Drive, Suite 450, New York, NY 10015. Meet iEARN-USA staff, learn about our programs, and iEARN's 30 years of history. Drinks and light snacks will be served. Kindly RSVP on Eventbrite by Tuesday, November 21st .